… Apparently still a lot! On the 23rd November 2013 I announced that XOT-Uzg.v3 was going to change its name. Back then, the main reason was to make it more clear for people, especially none-Dutch speaking people, what the add-on did. That day XBMC Online TV was born. Then on the 1st of August last year, XBMC announced their name change to Kodi. So less then a year after the rename of XOT-Uzg.v3 to XBMC Online TV then next dilemma presented itself: to rename, or not to rename. As a response I wrote I wanted to see where Kodi was heading before rushing into any new naming. Now with the very first release of Kodi I have my answer….and work to do. Without an application called XBMC, the name XBMC Online TV does not make sense. So would Kodi Online TV be OK? Well, not really. Let’s start by saying that in Dutch, KOT does not really sound polite (it resembles a certain swear word). And now that I think of it, neither does it in English. Besides this, it is still a fact that the add-on also runs on XBMC4Xbox and if Kodi was in the name people might think it would not. The new name should not contain the words Kodi or XBMC. The new name should resemble the functionality the add-on has. The new logo should include the current icon (the yellow and red circles) so people will still recognise the logo after the name change. a survey or review of a past course of events or period of time. This new name actually fits the requirement very well: it does not contain Kodi or XBMC and it matches what the add-on does: it allows you to watch (review) past shows (events). So what about the logo? It should have the main icon in it. And I can tell you (and you have probably already seen it below) that the icon fits the logo very well. There are actually images: a logo and a banner. The new logo has the same font type as the old one and includes the main icon (the red and yellow ring). It has a gradient in the background, just as the old one had, and has the same shadow drop on the fonts and the rings. 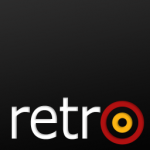 Because the full word ‘Retrospect ‘ does not fit a small area, I choose to only use the word ‘retro’ in the logo and let the ‘o’ consist of the rings. The word ‘retro’ is written with lower cases on purpose. The double ring that form the ‘o’ in ‘retro‘ are actually not the character, but form the borders of it: so the character ‘o’ is the black space in between. So besides the logo there is also a banner. The banner is mainly used on the website (Kodi does not support a ‘Wide banner view‘ for add-ons). The banner contains the full word ‘retrospect‘ and again has the ‘o’ made up from the rings. The bottom of the ‘p’ hits the bottom of the banner on purpose. The whole word ‘retrospect‘ is centred around the ‘o’ in the banner, where the ‘o’ is in the middle of the banner. Now there is a lot of work that needs to be done. Not so intelligent work actually, as it requires a lot of ‘find-and-replace’ actions in code, documents, language files, repository files and the complete website. I am combining this with replacing ‘XBMC‘ with ‘Kodi‘. So it is actually twice as much work. On last final thing: although I am renaming the add-on, I decided to not (or at least not for now) change the ID of the add-on the channel add-ons. They will remain net.rieter.xot and net.rieter.xot.<channel>. The main reason is that updating the ID’s of the add-ons will prevent the from auto updating.